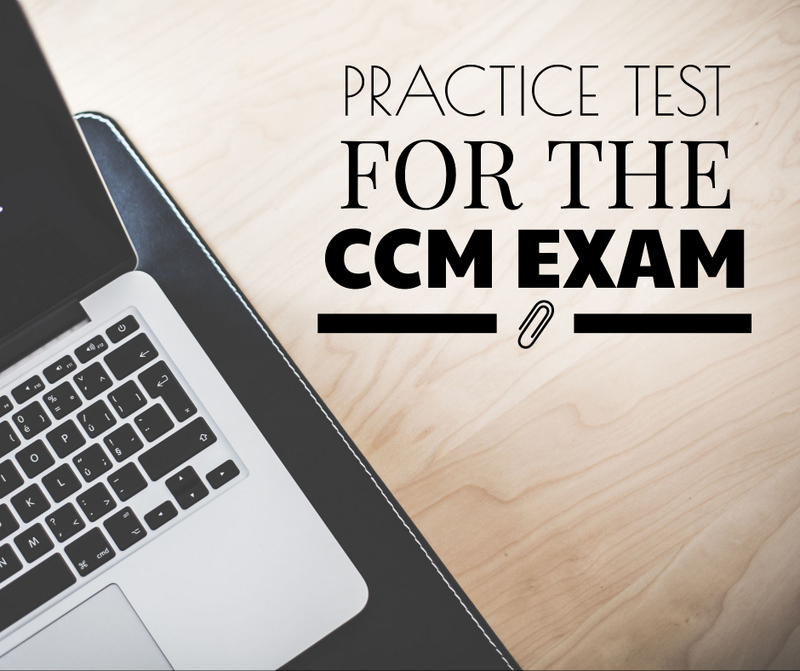 One of the most frequently asked questions we get is regarding CCM exam practice questions. We post a practice question each weekday in our FaceBook Group Case Managers Community, with the answer posted the following day. But many people are looking for more than this. So we began researching options. I would like to first stress the fact that I do not feel practice questions/tests are necessary to successfully prepare for the CCM Exam. Many people, including myself, have passed without taking a practice test. That being said, I do understand that some people like to add practice questions to the tools that they use to study. I would recommend that anyone who has test anxiety use a practice test that simulates the CCM exam as much as possible. They should use the practice test in conjunction with relaxation techniques and biofeedback to learn how to cope with and overcome their test anxiety. Practice questions/tests are also useful to gauge where you need to focus your study time. A good practice test will have questions in each of the Domains that CCMC will test you on and break down your results according to those domains so that you know where your strengths and weaknesses are. I do not recommend practice questions/tests be the only study tools used. You still have to learn the material. “Guessing” at answers and reviewing the rationale to the ones you miss is really not studying, it’s learning to pass the practice test. Remember, mastering the practice test is not the same as mastering the information you need to know to pass the actual test. The actual test will have different questions and answer choices. So what should you look for in a good practice test? There are 2 things that are crucial. First, you want to know who wrote it. The person who wrote it should have passed the exam! Be skeptical of any practice questions whether in a book or digital format that do not list the names and credentials of the authors. It is also important that the rational, and when appropriate references, are listed along with the correct answer. We were able to find a practice test we are proud to recommend: DataChem. DataChem met our minimum criteria stated in the last paragraph and also had additional features we feel are important. DataChem has a practice test mode that allows you to determine the amount of time, the number of questions and the domains to include in your practice test. You have an unlimited number of times to use the practice test mode and can adjust the time, number of questions, and included domains each time. In addition to the practice test mode, DataChem also has a study mode where you can read and answer one question at a time. You can also mark questions you are having trouble with and review them again at a later time. DataChem has a large number of questions in its question pool. This means that you will not get the same questions over and over. You have unlimited use of DataChem for the amount of time you purchase it for. The minimum is 60 days and the longest is 270. This is great because it gives you enough time to really use it to its fullest and not try to cram in all of your learning. You can use it as one of your study tools at regular intervals through your studies. I have created a demo video to walk you through some of the features of The Datachem CCM Practice Test Software. Click the link below to view the video and get additional information. When taking a practice test you will find information that is new to you. Don’t freak out! Use this as an opportunity to use your critical thinking and reasoning skills. You will come across questions on the actual test that you do not know the answer to. You have to know how to use the information provided and your knowledge base to answer these questions.